For Caz, summer is lazy weekends spent by the pool; friends and family dropping around for impromptu visits that often turn into BBQ lunches .. and then dinner because no one can be bothered to go home; floating on their backs under the stars; trying to cool off before going to bed. 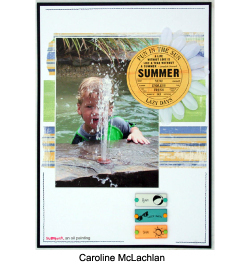 Caz used the Junkitz summer multi-stripe and spring seeds papers as they are bright and summery. BasicGrey summer rub-ons were added to the Junkitz double-playz and secured to the the page with brads. The large rub-on was added to the summer sunshine paper and then cut out to form the centre of the dasiy. 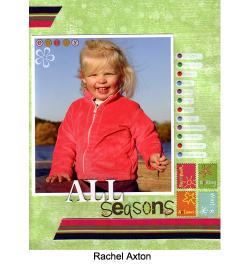 Caz used the Carolees onsert rub-ons to continue the seasons poem and added machine stiching to tie in with the other pages of her everyday moments album. Autumn is really a non-event for Marni and after racking her brain for a layout idea to do with Autumn, she decided to just do another layout on one of her most favourite seasons Summer. Marni's favourite thing to do in Summer is to just hang out near or in the water preferably at the beach, so to celebrate summer (again) she decided to scrap a photo of herself doing just that. Marni has just discovered a love of scrapping with orange, and with orange being such a summery colour she used it as her colour palette for this layout with a little white and black thrown here and there for good measure. By doing this she has created a feeling of a fun, hot summer day. 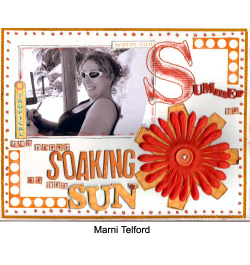 Marni used little Carolee's Creations cardstock letter stickers for the little and insignificant words in her title but she found that when she stuck them down they were just not the right colour. To fix this Marni lifted them off the page and mounted them onto a piece of orange paper and then inked and painted over the top of them so that they would blend in. Winter - snow, freezing, cold, flu, trying to keep warm, that is what winter is all about for Nic. It is her least favourite season. But when you take a photo like this one, it is hard to hate such beauty. Again for this last seasons layout Nic has used a mixture of rub-ons - including BaiscGrey, Heidi Swapp and the Carolees Creations onsert for the FK magazine. This time Nic has added the small BasicGrey snowflakes over the top of the Heidi Swapp ghost snowflakes - which the rub-ons attach to quite easily. 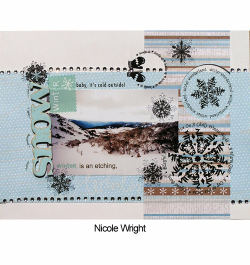 Nic has also used the winter papers from Carolees Creations and the word Snow is a Li'l Davis Vintage wood letter. Tamar was supposed to do a layout about autumn - to complete the 4 seasons - but from the begining she had this layout in mind. Whilst she likes the cool change, autumn is not particularly important to her. 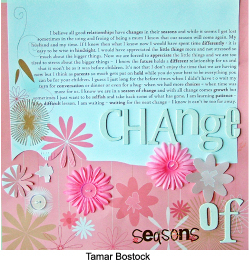 Instead Tamar chose to do a layout about Season of Change. Tamar always thinks of change when she hears the word season. Tamar hasn't completed a layout without pictures for quite some time but she really wanted to journal about how being a parent brings such a change to your relationship with your husband - the good and the bad about that. Tamar loves these Carolees papers - perfect for cutting out flowers to add dimension. She used the onset from FK for the title and printed directly onto the patterned paper and then adhered the chipboard title over the top. Tamar likes the fresh look of the white on white.. and the flowers offer hope.. for the next season. What could be nicer than having a new little great neice born in spring - spring the season of all things new and fresh. 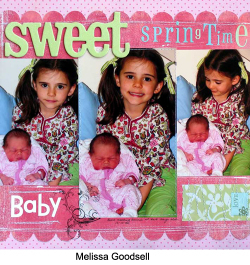 This is Bonnie meeting Mel's daughter Bella. Mel wanted to keep a fresh, spring look to this layout, so she selected a mix of pinks and lime greens and combined them together. Heidi tape is fast becoming a favourite product of Mel's and the summer garden pack worked beautifully with these photos. Rach totally adores this photo of Megan so she started with it and an idea to use every month of the cherryArte rub-ons down the side of photo. So when Rach started playing with the onsert from this months For Keeps magazine, it all sort of clicked together in a bright fun collision of colour. Rach finished off the layout with one of the most gorgeous Strano ribbons and some funky coloured Junkitz brads.